Clearpack is a leading global provider and manufacturer of packaging equipment and machinery for primary, secondary, and end of line packaging applications. Clearpack offers many years of experience in the packaging industry and its equipment is well known for reliability and quality. Clearpack sources a number of markets with packaging needs, including food, beverage, personal care and household products. 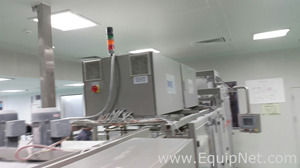 EquipNet is constantly receiving used Clearpack equipment through our exclusive contracts with our clients. Our inventory of used Clearpack products includes overwrappers and more. If you don't see the used Clearpack equipment you are looking for, call one of our representatives and we will find it for you. We can also source the right tooling and change parts that you need through our huge network of corporate clients around the globe. Clearpack overwrappers are well known for accessibility and cost efficiency. Clearpack overwrapping machines perform at exceptional speeds, ranging from 40 products per minute (individual pack wrapping) to 300 products per minute (highest output). EquipNet carries an abundance of Clearpack overwrappers to meet all your needs and requirements.